Historic town has three must-visit haunted structures. The town of Abingdon lies in Washington County, Virginia. It will take you about five hours to drive there from Colonial Williamsburg. Still, Abingdon is a unique place to visit, especially for fans of the outdoors. 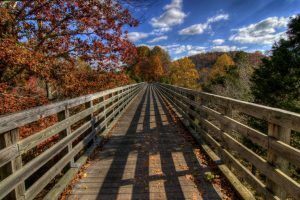 Home to the thirty-four mile long Virginia Creeper Trail, the town is a popular destination for hikers and horseback riders. Then, there is the Grayson Highlands State Park. which offers terrific views of Mount Rogers, the highest peak in Virginia. If you are an angler, the Holston River will put your fishing skills to the test – it is brimming with trout, walleye and bass. Abingdon also has a lively music scene. Local musicians and bands, such as Annabelle’s Curse, often perform at hobby shops, like Heartwood and Capo’s Music Store. Popular eateries, including Bone Fire Smokehouse and Wolf Hills Brewery, also frequently host live music. As for historic must-sees, Abingdon has its own Historic District, which became listed on the National Register of Historic Places in 1970. The district encompasses over one hundred and forty-five structures and buildings. Now three of them are rumored to be haunted: the Martha Washington Inn, the Barter Theater and the Abingdon Tavern. Before we dive into their spooky history, though, here’s a bit more on Abingdon’s past. Before the arrival of the colonists, Abingdon was the home of various indigenous cultures, including the Chisca and the Xualae. The Chisca Indians were first encountered by the Spanish explorer Hernando de Soto in 1542. The tribe was eventually swallowed up by the Shawnee and became extinct sometime during the eighteenth century. The Xualae Native Americans thrived along the banks of the Great Kanawha River, before the area was seized by the Cherokee in 1671. The land on which Abingdon falls was surveyed by Dr. Thomas Walker between 1748 and 1750. According to local lore, Daniel Boone once referred to the area as Wolf Hills, after “his dogs were attacked by wolves”1 during a hunting expedition. Soon, trades and businessmen began moving into the region. One of them, by the name of Joseph Black, constructed a fort to protect the settlers from Native American raids. Black’s Fort was completed in 1774, then became the county seat in 1776. It officially became incorporated as the town of Abingdon two years later. It is not clear what the town was named after. Some believe it was after Martha Washington’s ancestral home in Oxfordshire, England, while others say it was after a young English nobleman, named Lord Abingdon. The town of Abingdon arose rapidly along the Great Valley Road. By the late eighteenth century, it was one of the most important commercial and transportation hubs in Southwest Virginia. From handsome brick dwellings to ordinary county buildings, from mills to grocery stores, from taverns to youth academies – numerous buildings began popping up everywhere, to support the growing community. Today, Abingdon’s Muster Grounds celebrate the Overmountain Men’s adventures. Reenactments and interpretations of their feats are hosted regularly. The grounds encompass nine acres and is the northern trailhead for the three hundred and thirty mile long historic Overmountain Victory Trail. The two primary streets which support Abingdon’s beautiful Historic District are Valley Street and Main Street. Valley Street is the home of multiple colonial residences and businesses. The Alexander Findlay House, for instance, is its earliest surviving building. Findlay was a Scottish immigrant who became the first man on record to build a golf course. His one-and-a-half story brick home has been updated with several Colonial Revival additions. On 239 East Valley Street, you have the restored two-story Gabriel Stickley House. Stickley was a blacksmith and wagon builder. A few doors down, you can visit the Daniel Trigg House – which was built sometime during the early nineteenth century. Trigg was the mayor of Abingdon in 1846 and also served briefly as the president of the Exchange Bank of Virginia. Main Street runs parallel to Valley Street. It too is lined with many surviving colonial-era residences. On 171 East Main Street, for example, the red, Federal-style house of Colonel James White stands surrounded by trees. On 239 East Main Street, the brick, front-gabled dwelling of Judge John James Stuart is especially noticeable because of its unique shotgun architectural style. Lastly, on 153 West Main Street, you have the breathtaking mansion of Letty Floyd Johnson, who was the daughter of John Floyd, the twenty-fifth governor of Virginia. But Main Street is also your best bet to see some ghosts in Abingdon. All three of the aforementioned haunted places – the Martha Washington Inn, the Barter Theater and the Abingdon Tavern – are located on Main Street. The Martha Washington Inn was built by General Francis Preston in 1832, as a home for himself, his wife, and their nine children. Preston was an American lawyer and politician, born and raised in Abingdon. In 1858, the “inn” was sold to the founders of the Martha Washington College, who transformed it into an upscale women’s university. The school taught young women a variety of skills, which ranged from bookkeeping to French, from piano to home economics. Many influential women graduated from the Martha Washington College, including Eleanor “Nellie” Nugent Somerville. Somerville was the first female elected to the Mississippi Legislature and a strong advocate of women’s suffrage. She originally championed various other progressive causes, but became markedly more conservative as she grew older. She was the valedictorian of the Martha Washington College’s class of 1880. In the early 1900s, the nation was struck with a terrible outbreak of typhoid fever. This, combined with the effects of the Great Depression, forced the Martha Washington College to close for good in 1932. The building then opened its doors as the Martha Washington Inn in 1935. Throughout the decades, the Martha Washington Inn has catered to many famous people, including Eleanor Roosevelt, President Harry Truman, Jimmy Carter and Elizabeth Taylor. The facility was also used for a brief period of time as a second home to the actors of the Barter Theater. Prominent thespians, such as Patricia Neal and Ned Beatty, would often go there after a long day on the stage. In fact, it is said that an underground tunnel once connected the inn with the theater. Today, the Martha Washington Inn retains much of its authentic charm and architectural integrity. In the nineties, it became listed on The Camberley Collection of fine historic properties. Portions of the Prestons’ original brick residence remain intact. The inn’s main lobby, for example, was used by the Prestons as a living room. In the inn’s East Parlor, the family’s tall Dutch-baroque grandfather clock still stands. Modern additions, though (including a fully equipped spa and fitness room), have kept the inn attuned to the times. Another story tells of a young Confederate soldier, who was assigned to take important documents about where the Union army was camped to General Robert E. Lee. The man had a girlfriend who was studying at the Martha Washington College. Before leaving for his dangerous mission, the soldier tried to visit her, to say goodbye. He too attempted to sneak into the school through Abingdon’s subterranean cave system, but was caught by Union officers. The poor Confederate was shot to death, right in front of his sweetheart! Even though the inn’s floors have since been redone and re-carpeted, the bloodstain he left behind continues to reappear. The halls of the inn are also “dirtied” by the past. The ghost of a wounded soldier has been witnessed hobbling through its long hallways, aided by a crutch. He leaves a trail of mud in his wake. The basement of the inn also ranks high in supernatural occurrences, as it was once used to house black slaves. Don’t be surprised if you encounter a tormented African American spirit down there! Outside the Martha Washington Inn, people have seen the apparition of a horse, believed to have been the ride of a wounded Union soldier who came to be treated at the college in 1864. The phantom steed still wanders the inn’s grounds, waiting for his master to come out and ride home. The tunnel which once connected the Martha Washington Inn with the Barter Theater is rumored to be the home of an angry spirit – the ghost of a man who was killed in 1890, when the passageway collapsed. The actors who used the winding underpass during the 1930s and 1940s said they’d often sense his strong evil presence, lurking in the dark. The Barter Theater’s rehearsal hall is also no stranger to paranormal activity. Some say that it is haunted by the ghost of a housekeeper, who used to hold séances and imprison evil spirits in the theater’s now locked Pyramid Room. She is known to yell at those who stay too late or rehearse past working hours. The Abingdon Tavern dates back to 1779 and has served esteemed guests including President Andrew Jackson and Pierre Charles L’Enfant. It has been used as a bank, a bakery, a general store, a cabinet shop, a barber’s salon, a post office and private residence throughout the years. In 1965, the Abingdon Tavern was purchased by Robert Porterfield’s wife, Mary Dudley Porterfield. The servers and bartenders of the Abingdon Tavern have more than just guests to deal with. According to the restaurant’s owner, Max Hermann, he and his staff also have to put up with the various antics of the tavern’s numerous ghosts. Like the Barter Theater and the Martha Washington Inn, the tavern comes with its own impressive set of dead residents. There is the ghost of a cheating poker player, who was shot and killed a long time ago when his deception was discovered. There is the spirit of a prostitute, now known as the “Tavern Tart,” who still likes to grab at men’s bottoms and flirt with customers. There is also the ghost of Captain Gordon William Rife, who was killed by the angry husband of a woman he was sleeping with. 1. “History of Abingdon.” VisitAbingdonVirginia.com, 2016. Web. 4 September 2016. Para. 3. 2. Jones, Randell. “The Overmountain Men and the Battle of Kings Mountain.” Learn NC, 2009. Web. 4 September 2016. Para. 28. 3. Kermeen, Frances. Ghostly Encounters: True Stories of America’s Haunted Inns and Hotels. New York: Warner Books, Inc., 2002. 4. Kermeen, Frances. Ghostly Encounters: True Stories of America’s Haunted Inns and Hotels. New York: Warner Books, Inc., 2002. 5. Cales, Kelly. “Owner of Tavern: “By Midnight, We Try To Be Outta Here.” HeraldCourier.com. 31 October 2008. Web. 4 September 2016. Para 18.